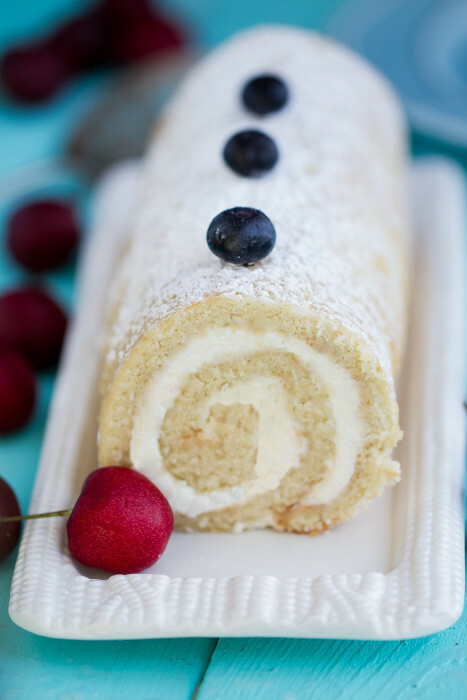 Vanilla Sponge Cake Roll – a simple vanilla cake roll that’s perfect for any summer celebration. 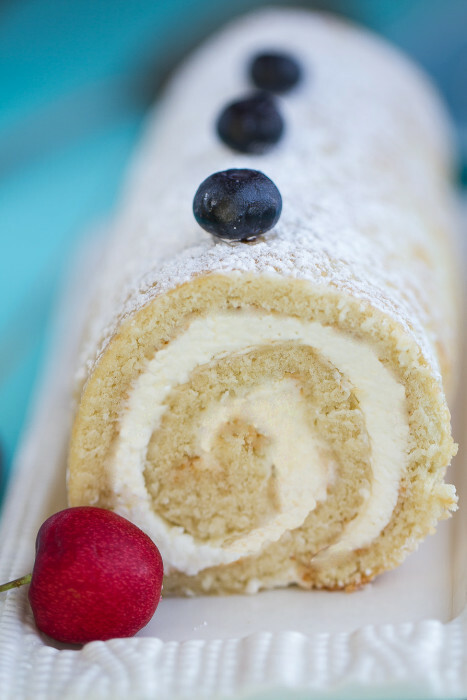 It’s filled with a creamy vanilla mascarpone filling and makes an impressive and light dessert. My mom wasn’t much of a baker when I was growing up but she more than made up for it by taking us to the most amazing bakery across town almost every Saturday and let us pick out any one thing we wanted. My brothers and I always took our time combing through the display glasses and oohing and aahing over what we should choose. My eyes always led me back to the beautiful cake rolls behind the display. They were reserved for other customers who had pre-ordered them and I remember wishing that I could be one of those lucky customers. One Saturday on our regular stop to the bakery, the nice woman behind the counter took out a pretty Vanilla Cake Roll from behind the display case and placed it in a box for my mom at the cash register. I remember just looking up at my mom with the biggest smile in disbelief. She said she had called ahead to place an order for me because I had done so well in school lately and she wanted to give me a special treat. It was seriously the best. day. ever. for my little eight year old self and I savored every last bite of that cake roll. 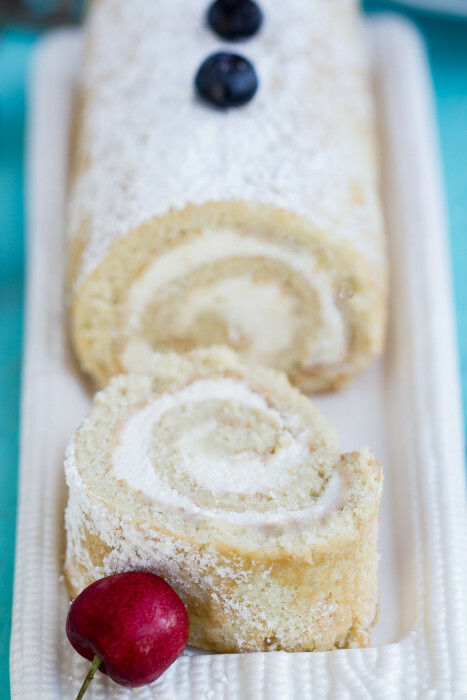 Because of that, cake rolls always hold a special place in my heart and they have been on my baking bucket list for the longest time. I’ve always been too afraid and thought they were really hard to make so I pushed them to the back of my mind. I finally worked up the nerve to make one back in June for this summer afternoon tea party we threw which you can read about HERE. 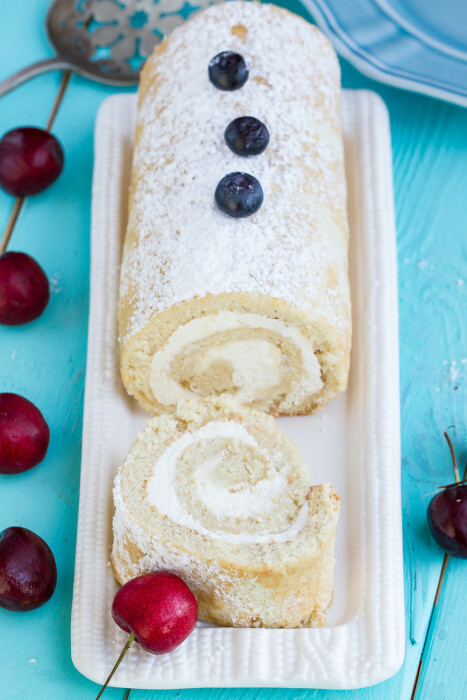 If you’ve never made a cake roll before, it’s really not as hard as you think. You can totally do it if I can! Since it was my first attempt, I decided to keep it simple with a Vanilla Sponge Cake Roll which I baked in the 10 x 15 pan over a sheet of parchment paper with a misting of baking spray. 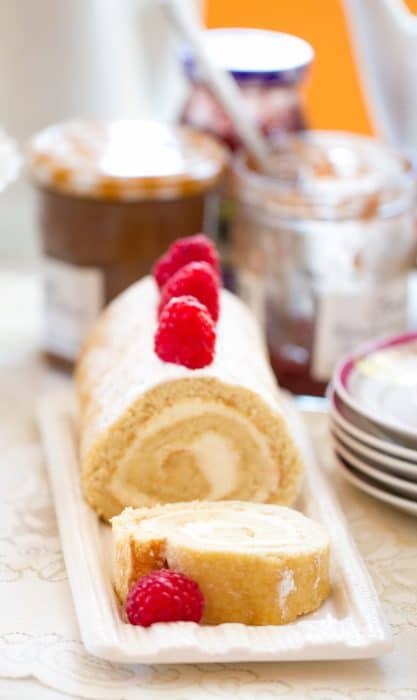 Once the cake has cooled to room temperature, just unroll it and spread an even layer of the dreamy vanilla mascarpone cream filling and roll it back up to chill in the fridge for at least an hour. This cake was light, tender and almost melts in your mouth with the creamy vanilla mascarpone filling. You can dust it with powdered sugar and serve it with some fresh fruit or glam it up with your favorite frosting and sprinkles. In a large mixing bowl beat egg yolks and eggs for 2-3 minutes. Add sugar, water and vanilla and beat an additional minute until fully incorporated. Sift in flour, baking powder and salt and turn the mixer to low until just combined. Gently fold in egg whites. Pour into prepared baking sheet. Bake in preheated oven for 9 - 12 minutes or until the cake is golden or springs back when gently pressed in the center. Make sure to keep a close eye on it after 7 minutes so it does not overcook. Remove from oven carefully with oven mitts or towels and immediately flip cake onto the prepared powdered sugar towel. (This will cause the powdered sugar to splash everywhere - this is normal) Peel off parchment paper. Place a clean sheet of parchment paper over back of cake and roll cake up in towel carefully (from short end to short end). Cool for one hour. To make filling Whip the cream with an electric mixer until it forms stiff peaks. In another bowl using a rubber spatula, beat Mascarpone cheese with powdered sugar and vanilla. Fold in whipped cream. Set aside in the fridge until ready to assemble. 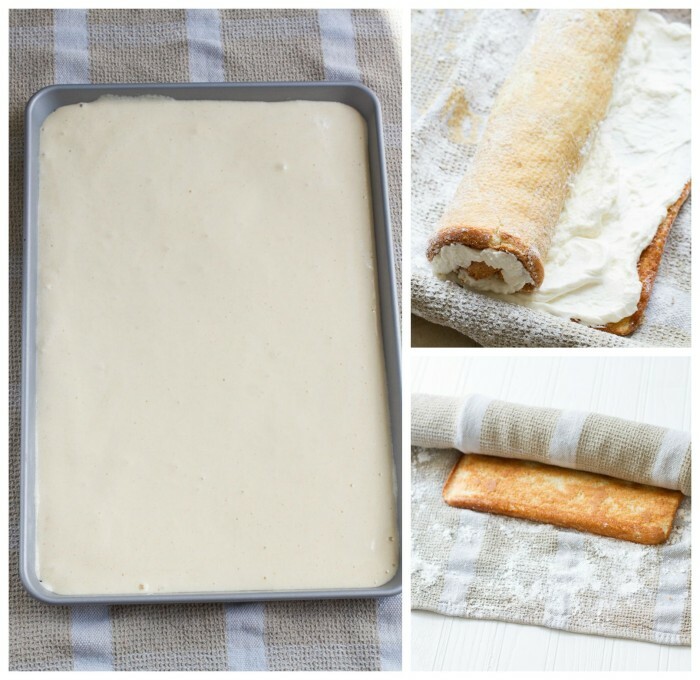 To assemble:When cake is cooled, unroll gently. Remove parchment paper and spread filling in the cake. Re-roll the cake tightly without the towel. Refrigerate cake on a plate with plastic wrap over the top. When ready to serve, remove plastic wrap and sprinkle with powdered sugar or decorate with frosting if desired.